WELCOME TO OUR TABLE ROCK LAKE RESORT! There’s something for every member of the family here at Hickory Hollow Resort...we’re a pet friendly vacation getaway, so bring the furry member of your family along. You can enjoy swimming, water sports, volleyball, playgrounds, fishing, sight-seeing, bird watching, and hiking. Spend a day visiting near-by attractions like Silver Dollar City, the exciting entertainment in Branson, or Eureka Springs' Victorian elegance and intriguing shops. Of course, we're a wonderful place for just plain relaxing. Stay in one of our one, two or three bedroom Table Rock Lake cabins, condominiums, or in one of our three or four bedroom Table Rock Lake house rentals, all located on the wooded shore overlooking one of the best fishing areas on Table Rock Lake. We are open all year, so you can join us for the White Bass runs in March and early April and again in September or October. Crappie, Bass, and Catfish are caught year ‘round. 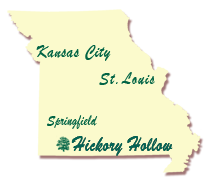 If you’re looking for Table Rock Lake vacation rentals, you’ll not find a better variety of lodging on beautiful Table Rock Lake than what we offer at Hickory Hollow Resort. Come and enjoy your very own relaxing getaway at one of our Table Rock Lake Cabins! See all Reservation Info on one page. Check out availability on ALL the cabins at once. See the All Units Page for all the details.